Movistar Yamaha MotoGP’s Jorge Lorenzo and Valentino Rossi got down to business during a perfectly sunny first day at the Misano World Circuit Marco Simoncelli. They completed 37 and 40 laps respectively to find good set-ups for their YZR-M1s for Sunday’s ‘Grand Prix di San Marino e della Riviera di Rimini’ and finished the day in fourth and sixth place. 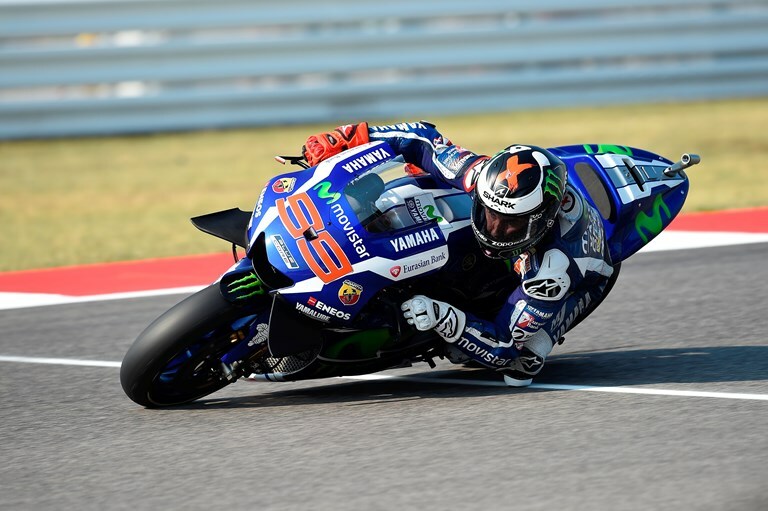 Lorenzo made a great start this morning and was quick to find a solid pace around the Misano Circuit. He used the 45 minutes of free practice to find a good set up for the track and worked hard as the times dropped towards the end of the session. With less than half a second covering the top ten in FP1, he secured a top5 placement with a 1’33.774s best lap. Feeling comfortable with the setting he and his team had established in the morning, the defending World Champion found a good rhythm in the afternoon. Though he had already used his second set of tyres midway through FP2, leaving him with no spare tyres at the end, he was still able to make a solid improvement over the two sessions. The Mallorcan took more than 0.7s off his time with a 1’33.056s lap at the end of the session, to finish in fourth place in the combined standings. Rossi made a perfect start to his home GP weekend today under hot and sunny conditions. He spent the first part of the session focusing on the balance of his bike, before it was time to put his YZR-M1 to the test. Cheered on by the passionate Italian fans, the local hero put his head down at the end of the session to take first place from Pol Esparagaró, by 0.136s, with 1’33.451s lap for a Yamaha 1-2. The Italian kept his form in the afternoon session as he put his attention towards elongating the life of his front tyre. Despite the hot conditions and traffic on the track he steadily improved his lap times to move up the order into the top three towards the end of the day. His best lap, a 1’33.387s, set before a last-minute flurry of activity, saw him finish in sixth place in the combined free practice times. The Monster Yamaha Tech3 team rider Pol Espargaro ignited his San Marino GP campaign with a highly positive start aboard the Yamaha YZR-M1 after completing the first day of action at the top of the field. The 25-year-old got straight into action in the opening shakedown and after commencing his set up work, he impressively concluded the practice in second but only a mere tenth of a second behind the leader. The afternoon session began with the weather conditions still being perfect and Espargaro carried on from where he left off. His lap times progressively improved before he blazed across the finish line to post a scorching lap time of 1’32.769 which left him 0.069 clear of the next rider. The outstanding performance marks the perfect comeback from an unfortunate crash at Silverstone, where he was lucky to escape any serious injury and he will look to continue the momentum tomorrow by seizing a top tier grid position. On the other side of the Tech3 pit box, Alex Lowes impressed once again by ending FP2 in 15th as he stands in for his compatriot Bradley Smith. The young Briton commenced his first outing on the YZR-M1 at the San Marino track with a solid run to 18th in the morning as he continued to gather experience. The confident 25-year-old outlined his determination to succeed by completing more laps than any other rider in the session that saw 16 competitors covered by one second. After midday, he proceeded to make further strides forward and eventually sped to his personal best that was notably only just half a second from top ten. The British star now aims to carry on his progression by clinching a strong qualifying position tomorrow for Sunday’s 28-lap sprint.